Madden NFL 13 Ultimate Team is a free-to-play game mode that perfectly combines Madden NFL Football, fantasy football, and player trading cards. Earn, buy, auction, and trade players to build your ultimate team of NFL legends past and present and make your run for an NFL title. Pick a captain from your favorite NFL team and compete in all-new single-player challenges or battle online in head-to-head games. Pair the greatest quarterbacks in NFL history with legendary wide receivers to build a dream team that will dominate your friends and rivals. 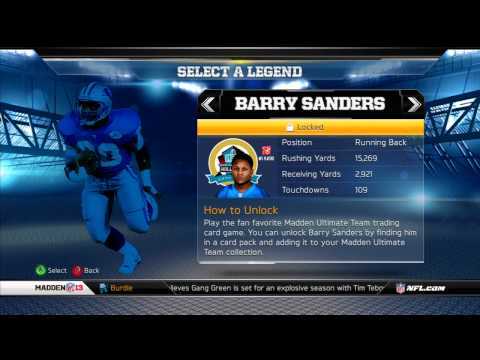 With NFL greats such as Joe Montana, Michael Irvin, Troy Aikman, Shannon Sharpe, Joe Greene, and Warren Moon new to Madden Ultimate Team, the number of legends available in-game has doubled. Plus, for the first time ever, Madden Ultimate Team features legendary coaches like Vince Lombardi and Tom Landry. Solo Challenges, an all-new way to prove your Ultimate Team’s greatness, presents you with a series of challenges based on real NFL events and additional premium games. As you progress, the challenges will become tougher and the rewards that much greater. Solo Challenges is an excellent way to earn coins and packs without having to play online head-to-head games. Playing Ultimate Team gives you the opportunity to unlock additional legends for Connected Careers. As you open packs and gain legendary coaches and players, simply add them to collections for use in Connected Careers. Manage your team anytime, anywhere using MaddenUltimateTeam.com. Whether you’re looking for an update on the latest promo, release schedules for content, or information on your Ultimate Team, this is the place to be. The site will constantly be evolving so check back often for new features and functionality. Madden NFL 13 Ultimate Team also features a number of updates, including a new reserve limit for easier team management, an increased auction house cap, a new hub experience, reward packs for returning users, and a free captain from your favorite NFL team. Most exciting of all you’ll be able to purchase all pack types with earned coins at launch.